What are the tonsils and adenoids? What do they do? 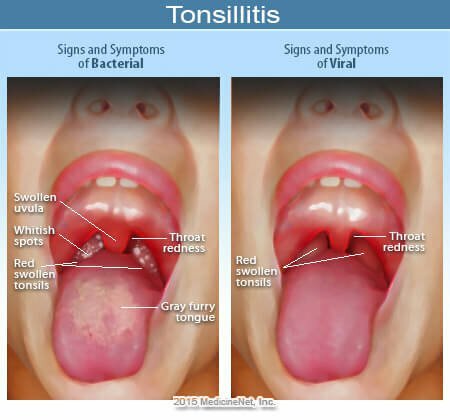 What are the signs and symptoms of tonsillitis or adenoid infections? What does tonsillitis look like (pictures)? How do medical professionals diagnose tonsillitis and adenoid infections? What medical treatments (antibiotics) cure tonsillitis and adenoid infections? What natural or home remedies help soothe tonsillitis pain and inflammation? When should the tonsils and/or adenoids be removed (tonsillectomy or adenoidectomy)? Which specialties of doctors treat tonsillitis and adenoid infections? Tonsils and adenoids are composed of tissues similar to the lymph nodes or glands. Acute tonsillitis is an infection of the tonsils caused by one of several types of bacteria or viruses. Chronic tonsillitis is a persistent infection of the tonsils and can cause tonsil stone formation. Peritonsillar abscess (quinsy) is a collection of pus behind the tonsils. Obstruction to breathing by enlarged tonsils and adenoids may cause snoring and disturbed sleep patterns. Doctors treat bacterial infections of the tonsils and adenoids with antibiotics. Medical professionals diagnose tonsillitis and adenoid infections with a history and physical exam. A health care professionals may order a throat culture and rapid strep test in cases of suspected bacterial tonsillitis. Doctors may recommend tonsillectomy and adenoidectomy (surgical removal of the tonsils) for (1) repeated or persistent infections; (2) when serious complications of infection occur; and (3) when enlargement of the tonsils and adenoids causes breathing, swallowing, or dental problems. The tonsils and adenoids are composed of tissues similar to the lymph nodes or glands found in the neck or other parts of the body. Together, they are part of a ring of glandular tissue (Waldeyer's ring) encircling the back of the throat. The tonsils are the two oval-shaped masses of tissue on either side of the back of the throat. Normal tonsils are usually about the same size and have the same pink color as the surrounding area. On their surfaces are little depressions, called crypts, which may appear deep and contain pus-filled pockets or tonsil stones. The adenoids are located high in the throat behind the nose and soft palate (the roof of the mouth) and unlike the tonsils, are not easily visible through the mouth. A tonsillectomy and an adenoidectomy (commonly referred to as a T & A) are surgical procedures performed to remove the tonsils and adenoids. The tonsils and adenoids are part of the immune system thought to assist the body in its defense against incoming bacteria and viruses by helping the body form antibodies. However, this function may only be important during the first year of life. There is no evidence to support a significant role of the tonsils and adenoids in immunity. Medical studies have shown that children who have their tonsils and adenoids removed suffer no loss in their future immunity to disease or ability to ward off infections. When there is a sore throat and cold symptoms such as congestion, runny nose, sneezing, and coughing, the cause is most likely a virus. Viral infection of the tonsils or adenoids usually resolves without treatment within two weeks. Sore throat with a sudden mild fever, without symptoms of an upper respiratory tract infection, may point to a bacterial infection called group A beta-hemolytic streptococcus (GABHS). If these symptoms are present, see a doctor for diagnosis because of the risk of strep throat. Although strep throat will usually go away even without treatment, an untreated strep bacterial infection can lead to complications including rheumatic fever, which can permanently damage the heart. When there is a sore throat that does not affect the tonsils, medical professionals call this pharyngitis. When both the throat and the tonsils are affected, it's called pharyngotonsillitis. Tonsillitis may or may not be contagious, depending on the cause. If the cause is viral, it is usually contagious, but this depends upon whether or not a person has been exposed to that particular virus before. Mononucleosis, a viral cause of sore throat, is contagious the first time a person comes in contact with the virus, usually in childhood or adolescence. If the cause of the tonsillitis is bacterial, it is also contagious. For example, strep throat is highly contagious. If the tonsillitis and enlarged adenoids are chronic or caused by a chronic condition, such as sinusitis, hay fever or chronic rhinitis, it likely is not contagious. Physicians make a diagnosis of tonsillitis and adenoid infection based on a medical history and a physical exam. If symptoms suggest strep throat, the doctor may order a throat culture or rapid strep test, which medical professionals perform by swabbing the back of the throat and checking for the Streptococcus bacteria. This can be performed in the doctor's office. If a physician suspects the Epstein-Barr virus, which can cause mononucleosis, as a cause for the tonsillitis, a blood test for mononucleosis may be done. Antibiotic treatment may be needed if a bacteria caused the infection. In more severe, recurrent tonsillitis or adenoid infection, or in chronic cases, surgery to remove the tonsils or adenoids (tonsillectomy or adenoidectomy) may be recommended to cure the condition. Various antibiotics treat bacterial infections of the tonsils and adenoids. Tonsillitis caused by the Streptococcus bacteria can lead to serious complications. Once treatment begins, it is important to take the full course of antibiotics as prescribed because if you stop taking the drugs before they are finished it can lead to adverse consequences and regrowth of the bacteria. Physicians consider surgical removal in situations resistant to medical therapy or in frequently recurrent tonsillitis infections. Medical professionals often treat viral causes of tonsillitis or enlarged adenoids with only supportive care (hydration and control of fever) and over-the-counter pain medications. Do not give aspirin to a child or teen unless directed by a doctor due to the risk of a condition called Reye's syndrome. Antibiotics are not effective for viral infection of the tonsils. A peritonsillar abscess should be drained either by removal of fluid with a needle and syringe (needle aspiration), cutting open with a scalpel (incision), or tonsillectomy. People can remove chronic stones in the tonsil with a clean finger or with a blunt probe. A long course of antibiotics may treat massive enlargement of the tonsils and adenoids causing airway obstruction, or even a brief course of steroids to reduce inflammation (cortisone-related medications, such as prednisone and prednisolone). If a doctor has diagnosed tonsillitis, some home remedies can help soothe the symptoms of a sore throat. Some alternative remedies may help ease tonsillitis symptoms. Consult your doctor before using any alternative remedies. Doctors do not recommend many of these home remedies for use in children or adolescents as most have not been scientifically evaluated. Tonsillectomy and adenoidectomy are indicated in people with repeated or persistent infections, particularly if they interfere with everyday activities. The American Academy of Otolaryngology defines repeated infections in children as seven episodes in one year, or five episodes in each of two years, or three episodes in each of three years. Tonsillectomy and adenoidectomy are also warranted in situations where there is enlargement of the tonsils and adenoids to such an extent that it causes severe sleep problems (snoring and breath holding), sleep apnea, dental abnormalities, and difficulty swallowing. Adenoid enlargement alone, or in combination with tonsillar enlargement, can cause nasal obstruction, recurrent ear infections, or sinusitis. If these conditions are resistant to medical therapy, surgery is indicated to cure them. A significant episode of tonsillitis is defined by one or more of the following criteria: (1) a temperature greater than 101 F (38.3 C); (2) enlarged or tender neck lymph nodes; (3) pus material coating the tonsils; or (4) a positive strep test. In adults, the severity, frequency, and hardship associated with repeated infections are considered more important than the absolute number. Chronic infections characterized by bad breath and/or tonsillar stones causing significant disability are also indicators for tonsillectomy. Tonsillectomy and adenoidectomy are strongly considered in those patients who are suffering, or may suffer serious complications of infection. These include peritonsillar abscess, history of streptococcal complications (rheumatic heart disease, glomerulonephritis), or neck abscess. Suspicion of cancer (malignancy) or tumor is a definite reason for surgery. It should be emphasized that all decisions for or against removing the tonsils or adenoids are dependent upon the individual patient's particular situation. Additional factors, such as tolerance of antibiotics, concurrent medical problems, school achievement/progress, and family preferences are also important factors in the decision process. A primary care provider (PCP) such as a family practitioner, an internist, or a child's pediatrician may diagnose and treat simple tonsillitis and adenoid infections. If your tonsillitis is severe enough that you go to an emergency department, you will be seen by an emergency medicine specialist. If infections are severe, chronic, or recurrent, you may be referred to an otolaryngologist, also called an ear-nose-throat (ENT) specialist for further follow-up treatment or surgical removal of the tonsils and/or adenoids. American Academy of Otolaryngology - Head and Neck Surgery. "Tonsils and Adenoids." <http://www.entnet.org/content/tonsils-and-adenoids>. American Academy of Otolaryngology-Head and Neck Surgery. "Tonsillitis." February 2019. <http://www.entnet.org/content/tonsillitis>. Drutz, J. "Sore throat in children and adolescents: Symptomatic treatment." UpToDate. March 2019. <http://www.uptodate.com/contents/sore-throat-in-children-and-adolescents-symptomatic-treatment>. Paradise, J.L., and Ellen R. Wald. "Tonsillectomy and/or adenoidectomy in children: Indications and contraindications." UpToDate. March 2019. <http://www.uptodate.com/contents/tonsillectomy-and-or-adenoidectomy-in-children-indications-and-contraindications>.